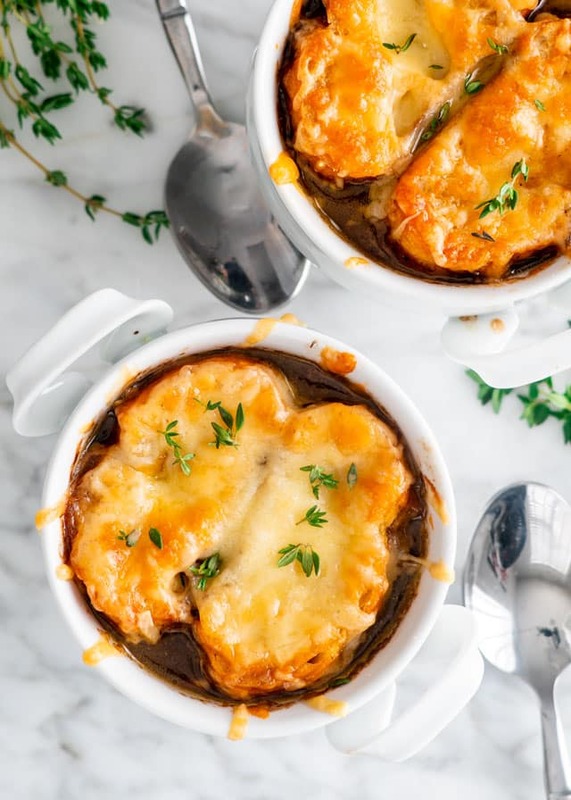 This French Onion Soup is a classic based on Julia Child‘s famous recipe. 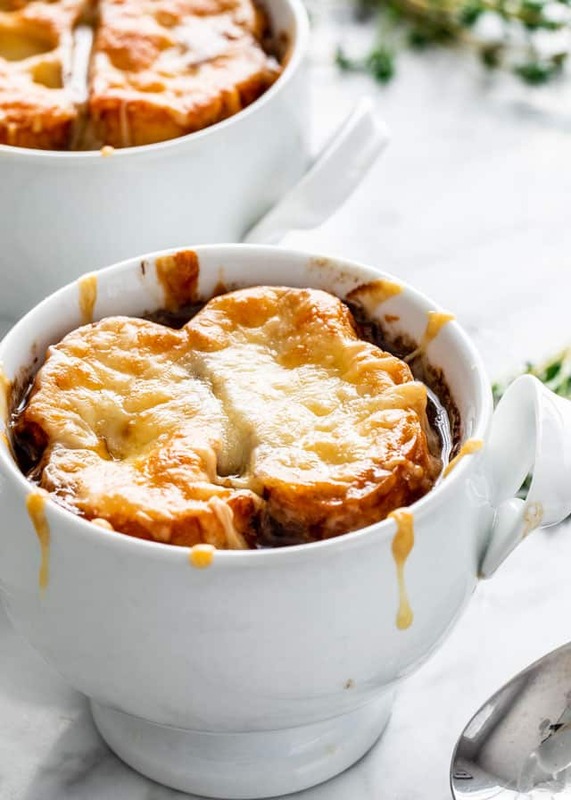 Buttery caramelized onions, rich and savory broth, cheesy toasted bread, this soup is flavorful and truly comforting. Over the holidays we’ve had some friends stay with us from Europe. During this time we took a short trip to Banff where we ate at a great restaurant. On the menu there was French Onion Soup and I had to order it, as it is one of my all time favorite soups. It reminded me how much I truly love this soup and also made me realize that it’s a recipe I haven’t yet shared with you. It’s an epic soup that most of us love and seek out at restaurants. For me it’s all about that rich and delicious broth that’s topped with cheesy bread. 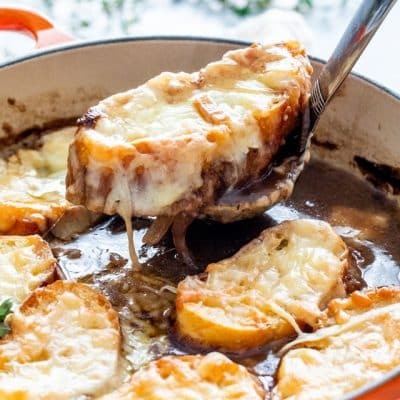 French Onion Soup is a classic soup usually based on meat stock and onions, then served with croutons or some sort of crusty toasted bread and cheese on top. Apparently, onion soups have been popular at least as far back as Roman times. However, it has grown in popularity in the United States since the 1960s. Probably because of Julia Child. 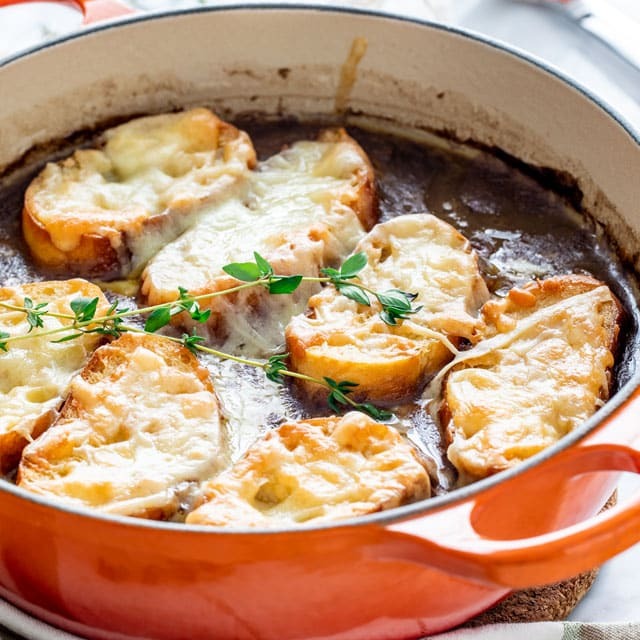 Does your choice of onion really matter when making French Onion Soup? I think so! Onions come in different colors and different flavors. However, it all depends on what flavor you’re going for. Some onions are bitter, some more sweet, some brighter and some deeper and more complex. I prefer to use yellow onions, as did Julia Child. Yellow onions have a bright flavor and provide a lot of sweetness and very mild bitterness. If you like red onions, they have a deeper flavor, but slightly bitter and less sweetness. Shallots are also great because they provide a really good balance of sweetness, with bright and deep flavors. The secret to a good French Onion Soup is to slowly caramelize the onions. However, caramelization can be a wildly inconsistent process. The pots and pans you use, the fat, batch sizes, can all affect your end result. You can use Dutch ovens or non stick skillets. However, you should realize that onions take a long time to caramelize. On the stove top, it could take at least an hour to properly caramelize onions. You shouldn’t rush this process, because the onions are the secret to a true rich and delicious broth. According to Julia Child, the first step is to soften the onion in a bit of oil and butter in a pot with the lid on. You want to make sure to put the lid on for the first 20 to 30 minutes. If you don’t, you risk burning the onions quickly. After this remove the lid and continue cooking them for another 30 minutes, stirring occasionally. I used a Dutch Oven enamelled pot. You’ll find that with enamel surfaces, the bottom will brown quicker while the onions tend to remain white longer. However, don’t worry, as soon as you add the broth, you can scrape all those browned bits and they will flavor your soup nicely. I also added added a bit of sugar. Sugar is commonly added to onions to speed up their caramelization. Although I used a very small amount, you’ll find that it will boost the onions’ sweetness quite a bit. The onions are caramelized when they are translucent and golden, not crisp and burnt. 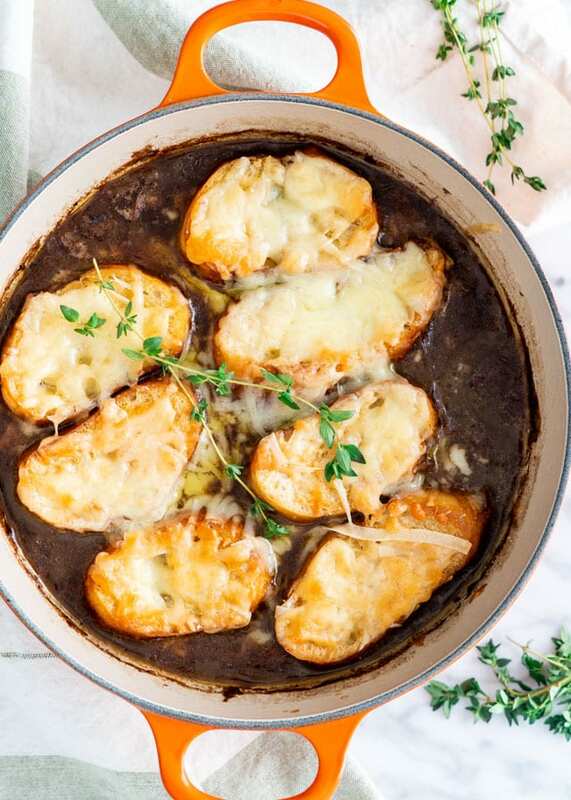 Making French onion soup is actually quite simple. The hardest and longest part is just caramelizing the onion. If you want to completely make this soup from scratch, you’ll have to make your own homemade broth or stock. To simplify my life, I usually buy a low sodium or no sodium added beef broth and use that. What I don’t take shortcuts on is caramelizing the onions. Once your onions are caramelized in a bit of oil and butter, a bit of flour and a bit more butter is added to make a roux and thicken the soup a bit. Along with the beef broth, I like to add a cup of red wine to the soup to deepen and enrich the flavor. Herbs can be added such as bay leaves, thyme, or sage. I also love to add a bit of cognac to my soup, but it’s up to you. Last but not least, add your toasted slices of French baguette and lots of gruyere cheese. Pop the pot in the oven at 350 F degrees for about 30 minutes or until the cheese melts and brown spots appear. All that’s left to do is enjoy! 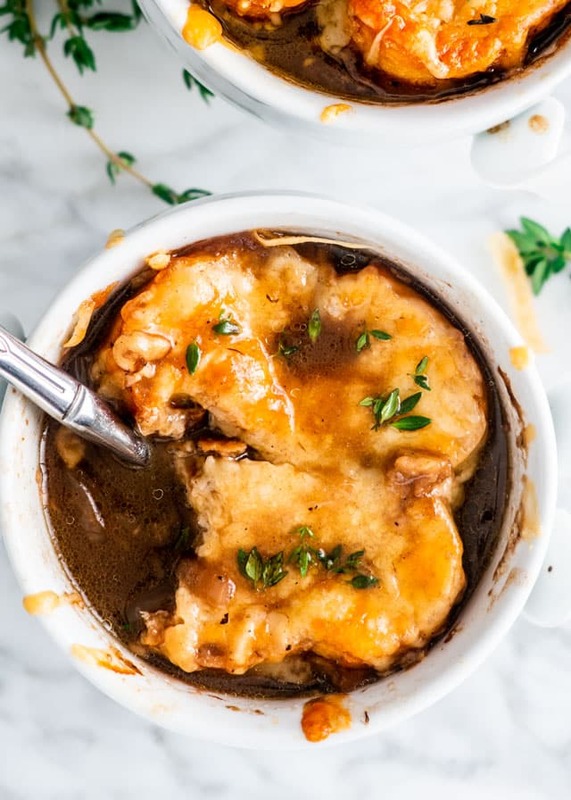 This French Onion Soup is a classic based on Julia Child's famous recipe. Buttery caramelized onions, rich and savory broth, cheesy toasted bread, this soup is flavorful and truly comforting. Caramelize Onions: In a large heavy pot such as a Dutch oven, add the olive oil and 2 tbsp of butter. Cook on medium until butter melts. Add the onions and give them a stir to coat them in the oil. Cover the pot with a lid and cook for 20 minutes with the heat still on medium, stirring every few minutes. After 20 minutes the onions should be transparent. Remove the lid and stir in the sugar and salt. Continue cooking for another 40 minutes, stirring occasionally. The onions are done when they are a deep golden color and sweet. Make a Roux: Add the flour, and remaining 1 tbsp of butter and stir. Cook for about 2 or 3 minutes, just enough to cook the flour and remove that flour taste. Deglaze: Add 1 cup of the beef broth to the pot and stir. Cook for about 1 minute while stirring to scrape the bottom of the pot. You'll see it evaporate almost immediately. Add broth, wine and herbs: Add the rest of the broth to the pot, followed by the red wine, bay leaves and thyme sprigs. Simmer: Bring to a boil, then turn down the heat and simmer for 30 minutes, uncovered. Season and add cognac: Taste for seasoning and adjust with salt and pepper if needed. Stir in the cognac. Add bread and cheese: Top the soup with about 1 cup of gruyere cheese. Add the slices of bread over the cheese. I prefer to toast my bread first then add it to the soup. To toast the bread, lightly sprinkle the bread slices with some olive oil, transfer them to a baking sheet and toast them under broil for about 30 seconds to a minute per side. Top the soup with toasted bread, then top with remaining gruyere and parmesan cheese. Melt cheese: Preheat your oven to 350 F degrees. Transfer the pot to the oven and bake until the cheese melts and starts to brown, about 20 to 25 minutes. Ladle into bowls and serve. Onions - I prefer to to use yellow onions because of their bright flavor and sweetness. Shallots are also great because they provide a really good balance of sweetness, with bright and deep flavors. Beef Broth or Stock - If you're not making your own stock, use a good quality beef broth, preferably with no salt added. This way you can control the salt in the soup yourself. Wine - Use a red wine such as Cabernet Sauvignon, Merlot or a Malbec. Cognac Alternative - If you don't have cognac, use a brandy, or simply skip it. 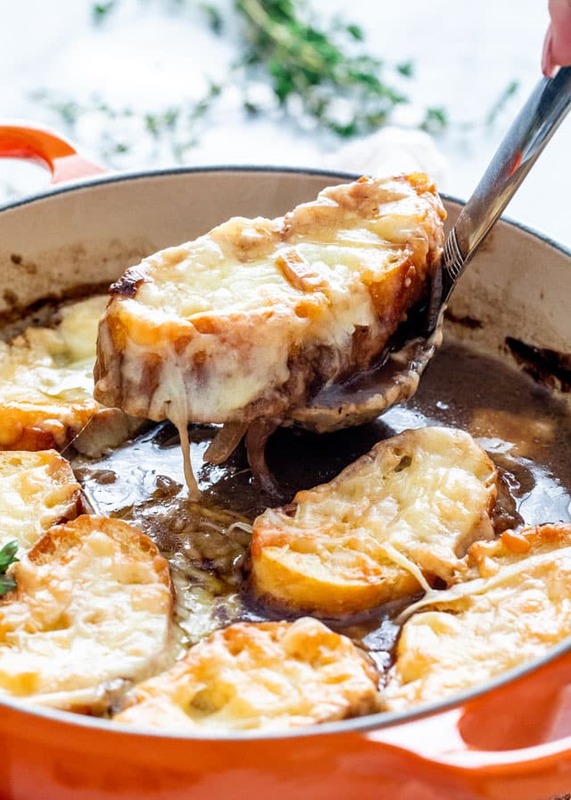 Cheese - French Onion Soup demands Gruyere cheese because it's rich, smooth and melts with ease! 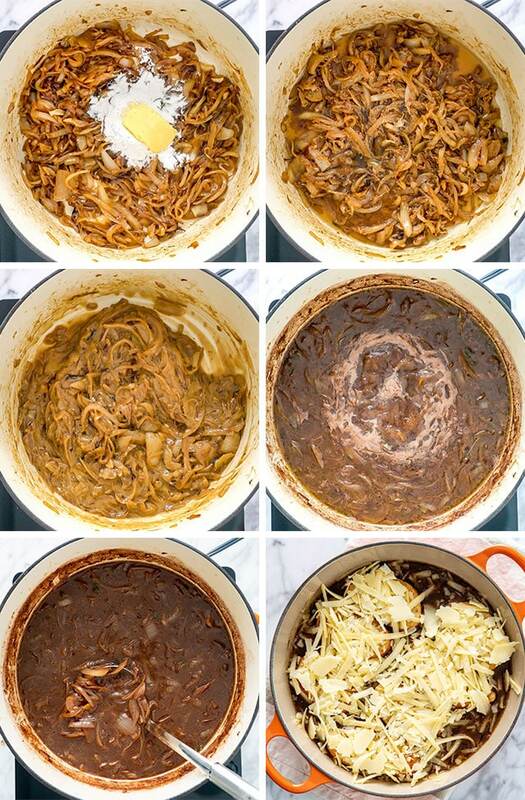 Storage - Transfer French Onion Soup to an airtight container and store in the refrigerator for 3 to 4 days. Freeze it in covered airtight containers or heavy-duty freezer bags for up to 3 months. I shall try this recipe. I don’t usually have much luck with onion soup and it is my favorite. I think this time you’ll nail it! Hi Susan!!! Thank you so much, you made my day!